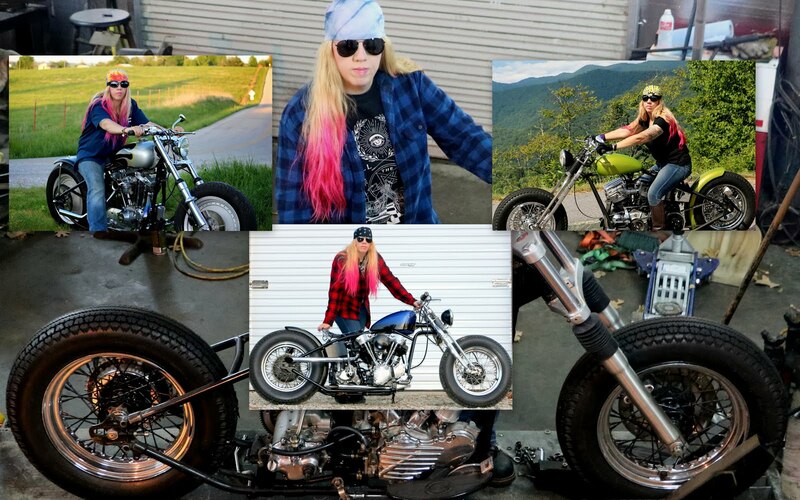 A little over a week ago and went and got my Panhead motor put on me permanently. I am doing a half sleeve and this is where I wanted to start. 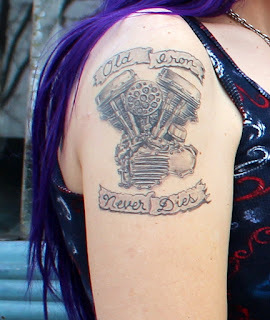 I also wanted "Old Iron Never Dies" since that is our motto and we both ride and drive old iron. 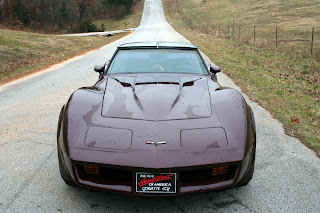 (Well, I guess TECHNICALLY my Corvette wouldn't be old IRON but maybe old FIBERGLASS, lol). 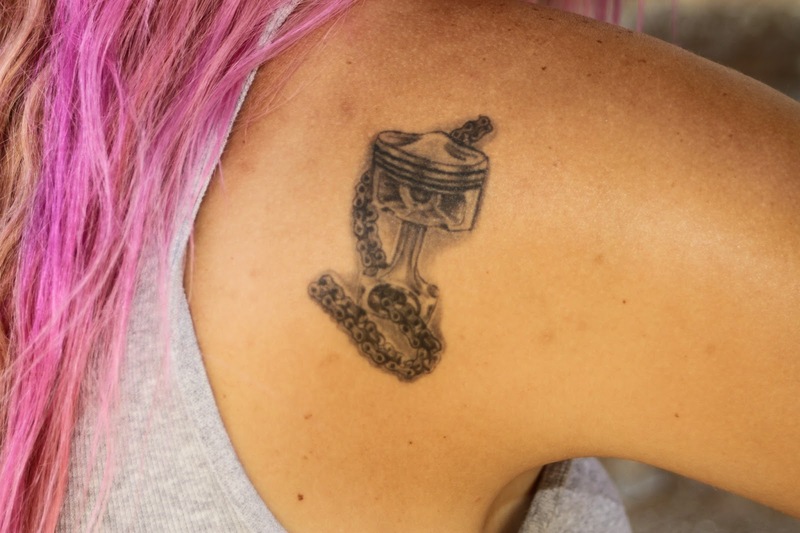 All of my tats are motor related and all mean something to ME. This one and the last one, the piston and chain were both done by the VERY talented and popular Sassy aka Dessa Blackthorn from Tattooz by Sassy in Mountain Home. I am SO SO glad I found out about her over 6 years ago and won't trust my body to anyone else. 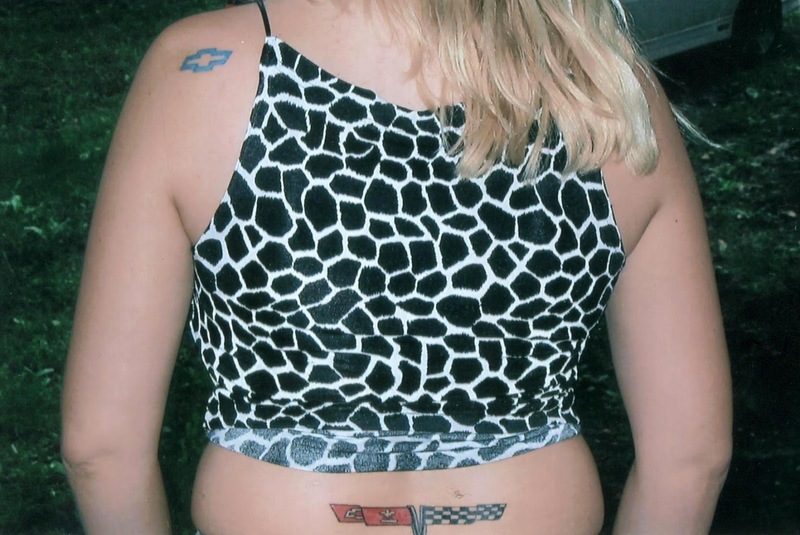 The first tattoo I ever got was my blue Chevy bowtie. Gabe also has a blue Chevy bowtie and one of his best friends has a red Chevy bowtie. I have been Chevy ALL my life. At 40, I have only ever owned Corvettes and Camaros- owning 5 Camaros- all but the first one being a Z-28, and 3 Corvettes. My baby, my 78 Z-28, is blue and was the 2nd car I ever bought and I have had it over 20 years. That was the reason for the blue Chevy bowtie. 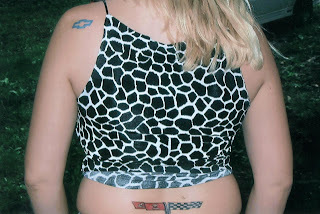 My second tattoo was the 1981 Corvette flags. The 81 model was different than all other models and the 81 was the first Vette I ever bought and I have had it over 13 years. My goal was to own a Corvette before I turned 30 and I ended up owning THREE of them before I turned 29! I ended up selling the other two- a 1975 and a 1980. The 1975 was a black Stingray that had a 4 speed that I bought and couldn't even drive! What a way to learn to drive a stick, that's what I say! My 81 flags tattoo is the same size as the emblem on the front. Ha, when I still had blond hair! 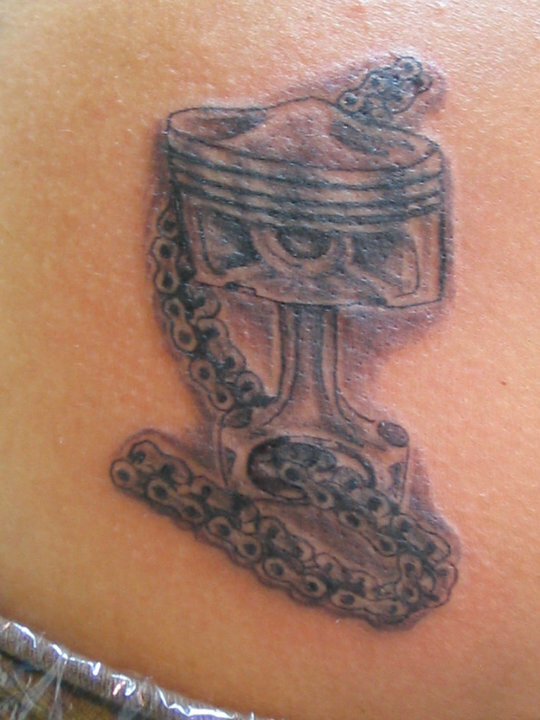 My third tattoo was the piston and chain tattoo that Sassy drew out and I LOVE it. I had it done in black and gray and I don't think I will ever do color again. I heard the same comments over and over "It is SO perfect it looks like a sticker". What's funny is now I am hearing the same thing about my Panhead motor tat. 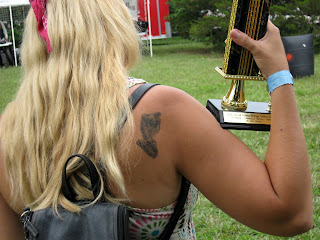 I have won several tattoo contests with the piston and chain, including a 1st place in "Individual Tattoo" in 2009- the first tattoo contest I ever entered..
After it was done in 2006 at Tattooz by Sassy. 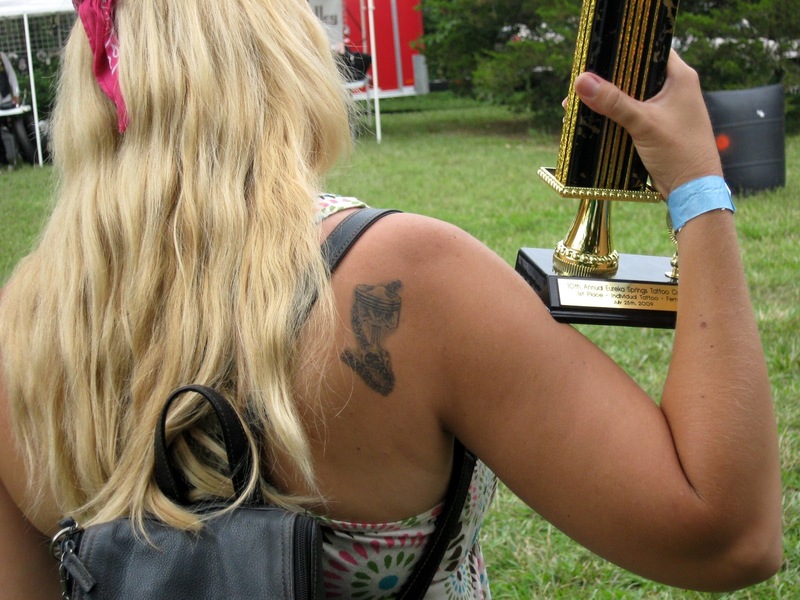 Winning 1st place in 2009 in Eureka Springs.